Cover art for The James Bond Encyclopedia was released. The new book from John Cork and Collin Stutz was created in collaboration with EON Productions and will cover details of the villains, Bond girls, allies, vehicles, and weapons and gadgets from all current 21 films. 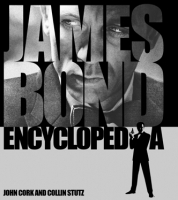 It also includes sections on “the 007 lifestyle, the role of Bond as interpreted by the six actors who have played him on the big screen, and double-page features on every Bond film, with details of production history, cast, and crew.” The book is said to contain more than 2,000 movie stills and other images. The book is currently set for release on October 1, 2007. Any idea if this Encyclopedia will include info on the books too, or just the films? Looks awesome. I’m drooling at the thought of over 2,000 pictures. It appears to be just the films. The page count is only 320 pages so it’ll be interesting to see how much content can fit with this supposed 2000 pictures. The Legacy had 320 pages, but it was also a larger size book (I don’t know if that matters). I kind of expect a lot of collages. Without sounding cynical, is it really possible to tell us or show us anything we’ve not heard about or seen before? After so much that has come before, any new “encyclopdea” needs to have an original angle. I wonder if this work has one. I’m sure a lot of it will be familar territory, but I’m also sure they’ll threw in some stuff that isn’t always covered or is new or is told from a different angle somewhat like The Legacy did. Too hard to tell. I’ll be picking this one up though. I hope it to do with the 45th annervary. I have only the 25th Annervary only with Eon productins movies. I want to update it. I hope to get this new James Bond Book. O meu já está garantido.